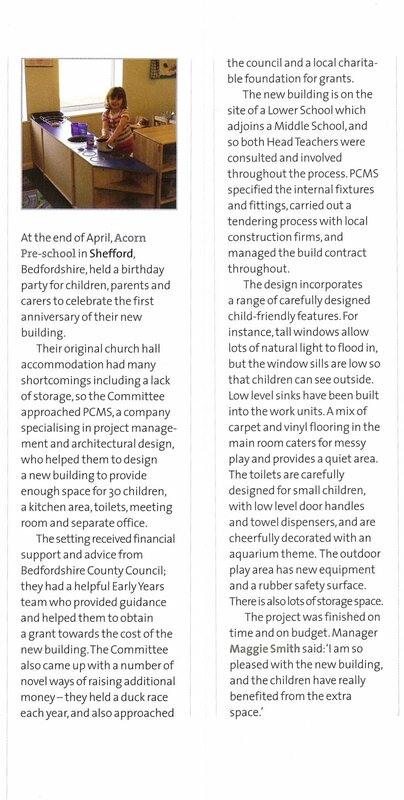 Acorn Pre-School, which is based in the town of Shefford in Bedfordshire, recently celebrated the first anniversary of moving into their permanent home. PCMS helped them to design a new building to provide enough space for 30 children which also incorporated a kitchen area, toilets, meeting room and separate office. PCMS specified internal fixtures and fittings, carried out a tendering process with local construction firms, and managed the build contract throughout. This entry was posted in Pre-School Learning Alliance, project management, School Construction on June 10, 2009 by admin. The construction of a new meeting room has recently been completed at Shefford Lower School in Bedfordshire. PCMS helped to overcome a number of design and sequencing challenges at the outset to ensure that the project ran smoothly. Despite the school having been extended a few years ago, previous meeting space had been turned into an IT suite there were limited options for building elsewhere on the school site. The solution was to infill some ‘dead space’ in a small courtyard area. A set of doors and a window were re-used, and building materials such as bricks and roof tiles were carefully matched with the existing school to achieve a seamless appearance with the new extension. Best of all, in order to minimise disruption PCMS carefully programmed the construction works to coincide with school holidays. So re-siting of the door, window and path was carried out during the Autumn ½ term holiday, following by digging of the foundations in February and finally the walls, roof and interior fit-out were completed during the Easter break. This entry was posted in Bedfordshire, project management, School Construction, School Meeting Room on June 3, 2009 by admin. PCMS is pleased to announce that we are now registered as a Corporate member of the Association for Project Management (APM). This demonstrates an ongoing commitment to the professional development of our project and programme management, and is also a sign of our commitment to the profession. This entry was posted in APM, Association for Project Management, development, project management, training on June 2, 2009 by admin.